The McDonnell Douglas F/A-18 is a multirole fighter designed for aircraft carrier duty and is the first tactical aircraft initially designed to carry out both air-to-air and air-to-ground missions. The U.S. Marines ordered it as an F-18 fighter and the Navy as an A-18 attack aircraft. It can switch roles easily and can also be adapted for photoreconnaissance and electronic countermeasure missions. The resilient F/A-18 Hornet was the first aircraft to have carbon fiber wings and the first tactical jet fighter to use digital fly-by-wire flight controls. Variants included a two-seater, an improved fighter, a reconnaissance aircraft and a night-attack fighter. Since the first Hornet entered service in 1980, McDonnell Douglas built over 1,200. Overseas, Hornets served with the Australian, Canadian, Spanish, Kuwaiti, Swiss, Finnish and Malaysian air forces. In November 1986, the 40th anniversary of the Navy's Blue Angels, the demonstration squadron replaced its A-4 Skyhawks with F/A-18 Hornets. They saw use as a show aircraft the following season. Hornets entered active duty in January 1983. In 1986, Hornets on the USS Coral Sea flew their first combat missions. During the 1991 Persian Gulf War, while performing an air-to-ground mission, Hornets destroyed two Iraqi MiG-21s in air-to-air combat. During 2001, Hornets provided around-the-clock battlefield coverage in the Afghanistan theater of operations. Thought most F/A-18A Hornets have been withdrawn from service, those modified to F/A-18A+ and the remaining F-18C models are still viable weapons systems and continue to operate with fleet units. As most of you probably know by now, the same company that owns Trumpeter, also owns Hobby Boss. As a result, you see many of the same subjects that Trumpeter has produced being resized and improved for the Hobby Boss label. That is not the case here as Trumpeter does not do an F-18 Hornet, and Hobby Boss has logically decided to go with the first of the series, the F-18A. In this case, it is the aircraft from the earlier years, but not the very first ones as it does have the additional LEREX plate that helps smooth the airflow around the vertical stabilizers. I don't see any reinforcement plates on the stabs so I'm thinking that perhaps those were after the LEREX plate were installed. There are far too many large sprues to show them, so I've copied the layout page from the instructions. The kit does follow with most modern models in that the detailing is engraved, and this includes the engraved rivet detail. This is one of the current fads in modeling aircraft and you either like it, hate it or figure it is no big deal. In my quest for molding faults, I found only ejector pin marks inside all the gear doors. No sink areas, no flash and the rest of the molding is very good indeed. The kit is molded like nearly every other F-18 kit I've seen in that the fuselage is split horizontally with the upper win g molded with the upper fuselage. There are separate flaps, ailerons, and slats as well as a separate nose. The only reason I can think that this latter feature is included is so that later versions with longer noses or camera bays can be done. This is certainly the case with offering a two seat variant later as even the upper cockpit area and seats are in a separate bag from the rest of the kit. Landing gear is suitably complex and should please most if not all builders in this regard. One also finds suitably deep intakes and exhaust. Two designs of burner nozzle are given with one looking decidedly plain but not used on this kit. A boarding ladder is also supplied and though not shown, I would like to think that one could pose it up if needed. An area where this kit shines over the Hasegawa version is that it offers a large weapons load of Sidewinders, Harm, Harpoon, Mk-82 slicks and GBU-10s. JDAMS are also included, but these are not compatible with the era portrayed by the various decal options. Instructions are very well done and provide clear guidance on parts placement and colors. Speaking of which, those are offered in Gunze references. An FS 595 guide would be helpful as well, though most who build kits of this complexity will probably know what shades go where. Decals are provided for one of three aircraft. The box art plane is a later F-18A (163132) from VMFA-451 and is done in the later two greys TPS scheme. Other options are early F-18As. 161353 from VX-4 is in the three grey scheme applied early in production, while 161939 of VFA-25 is in an experimental scheme of overall FS 36320 aka Dark Compass Ghost Grey. The kit decals are well printed and an additional sheet offers weapons markings. Frankly, the yellow doesn't look opaque enough to my eyes so this may be an area of concern. 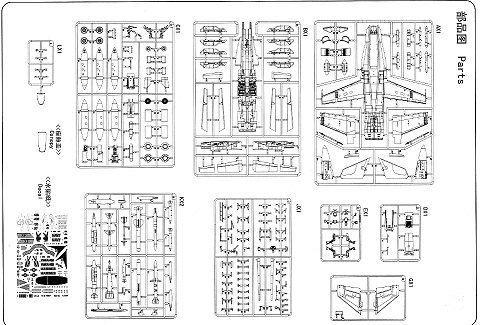 My experience with Hobby Boss decals has generally been quite good, though I'm sure that many of the aftermarket sheets available for the F-18A will fit this kit without any real problems. Though I've not built the Hasegawa F-18A in this scale, this one does not look to be any more difficult and from what I've heard from others, probably builds with less hassle, though to be fair, I'll withhold judgment until I've built this one. One thing for sure, it is a beauty and one that you should seriously consider if Hornets are your interest. My thanks to www.wingsntreads.com for the review kit. Get yours at a considerable discount.